This is the story of how I almost got rabies on our honeymoon and how my pride was wounded by a mountain and then built up again by some Germans. 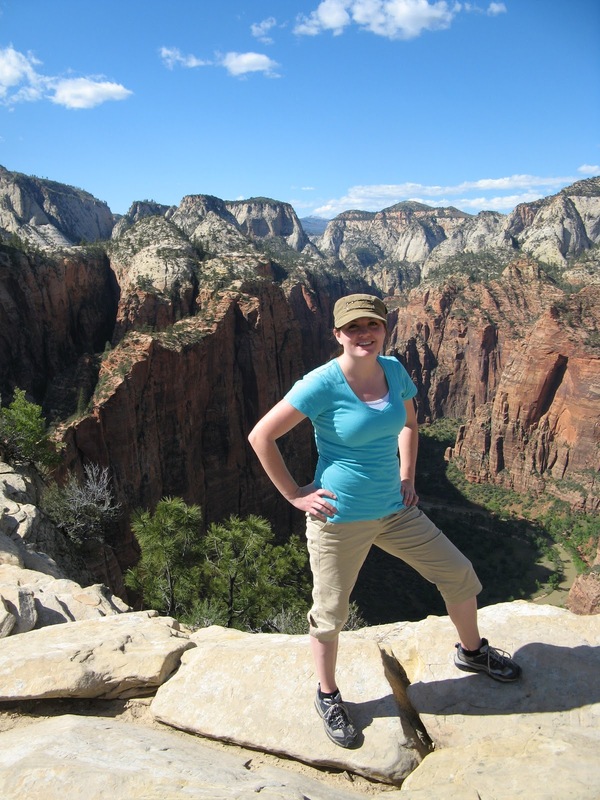 This, my friends, is the story of how I took on Angel’s Landing in Zion National Park. 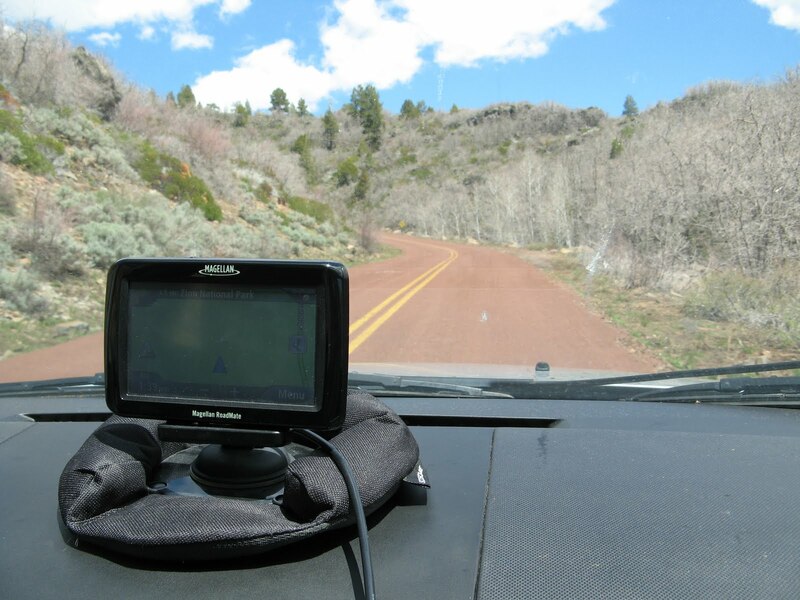 If you look closely at the above photo, you’ll see that our trip to Zion’s started out with the GPS getting lost. Yes, you read that correctly. Even the woman trapped inside the little GPS machine didn’t know where we were. Turns out that we should have taken the time and actually punched in an address instead of just using the machine’s built-in “knowledge” of where things are. I think the woman-in-the-machine told us we’d reached Zion’s Park about 5 times, even though each time we were confusedly in the middle of mountains and sagebrush and red road. He still doesn’t laugh about it. 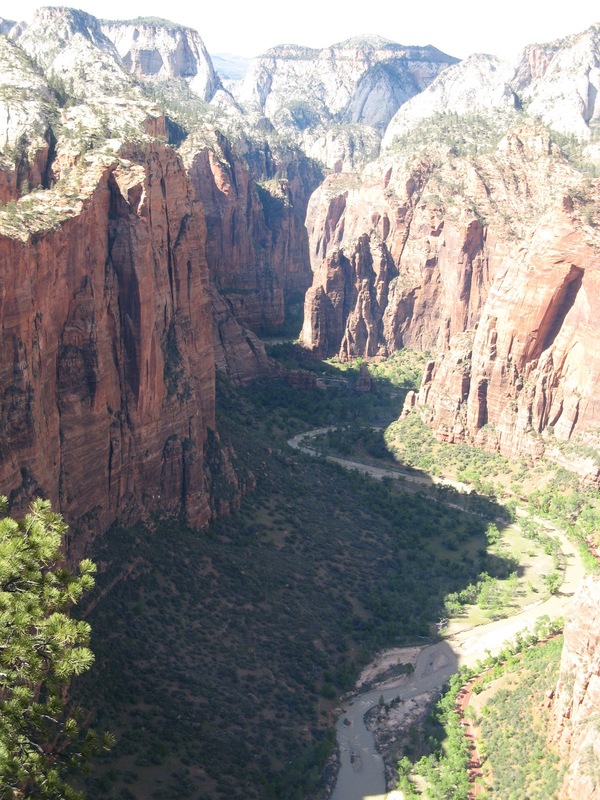 But now the real story begins–the story of Angel’s Landing itself. I really should start tuning into the warning signs that seem to be all around me when I take on some of these challenges, but my brain seems to suddenly not process information when it conflicts directly with something I want to do. Like in this case, some friendly fellow travelers on the bus ride up to the trails asked us which path we were wanting to hike. 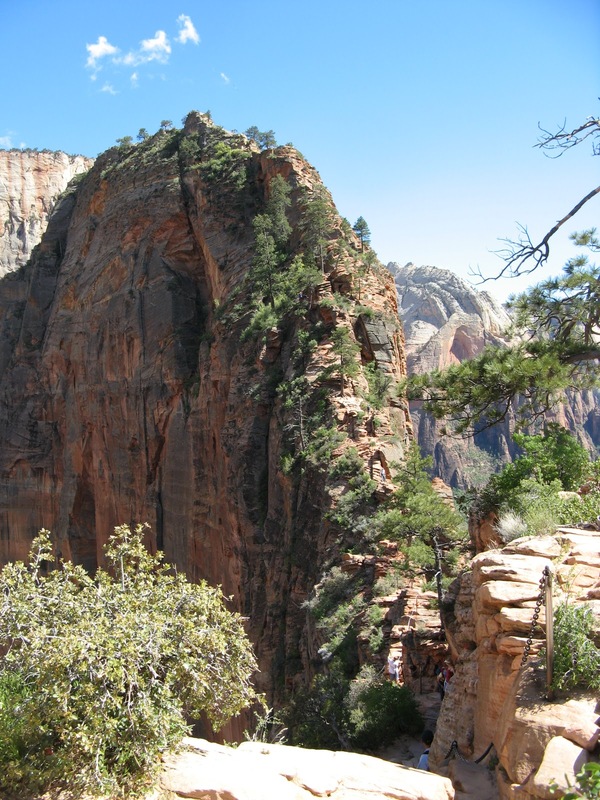 When we said Angel’s Landing, they looked at each other and then said, “Really? You guys gonna go all the way to the top?” That alone might not have been enough to set anything off in my head, but you’d think that when SEVERAL people asked us similar questions that I might have started to get worried. But me, in all my vanity with my hiking skills, took no notice. You see, I’ve always been a good hiker. Or so I’ve always thought. During girls’ camp (although that might not be the best measure of one’s hiking ability, but I digress), I was always hauling it up the mountain way ahead of everyone else and, as a result, getting in trouble by the leaders. 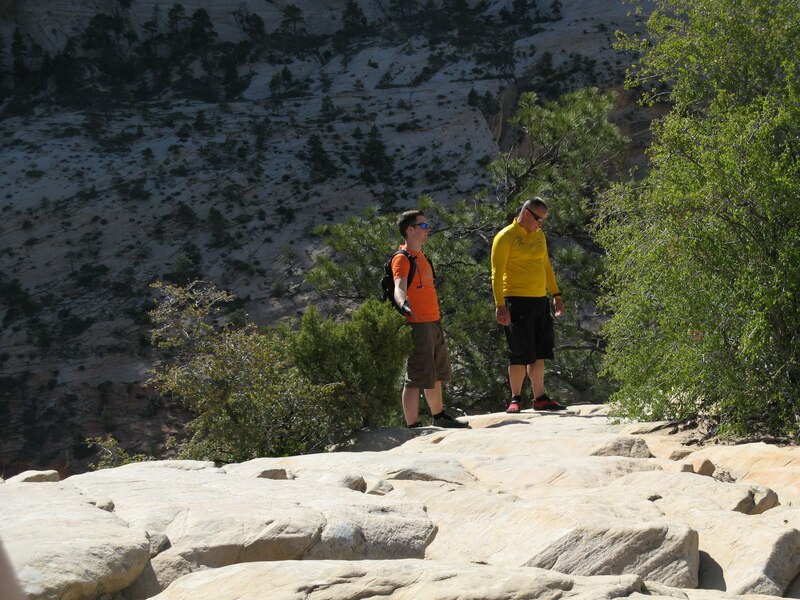 Or, when we’d do friendly hikes as friends or family, I seemed to keep up just great, if I wasn’t leading. There was the one case of the Havasupai trip backpacking out, but I blame an injured knee (although, if we’re being honest, I just wasn’t probably tough enough). You wanna know my reasoning for my confidence about Angel’s Landing? Two things–1) Anything Matt can do, I can do too, and 2) I spent a year and a half hauling my weight around volcanoes and gangs in El Salvador in Mary Janes, so I should be all over this. Matt warned me from the beginning that there were two sets of switchbacks. (For any non-hiker out there who’s not familiar with the term switchbacks, it’s just a cute, non-threatening way of saying those short trails of death that zig-zag back and forth up a mountain face when that mountain face is too steep to just go right up it).That fact should have been my second red flag. 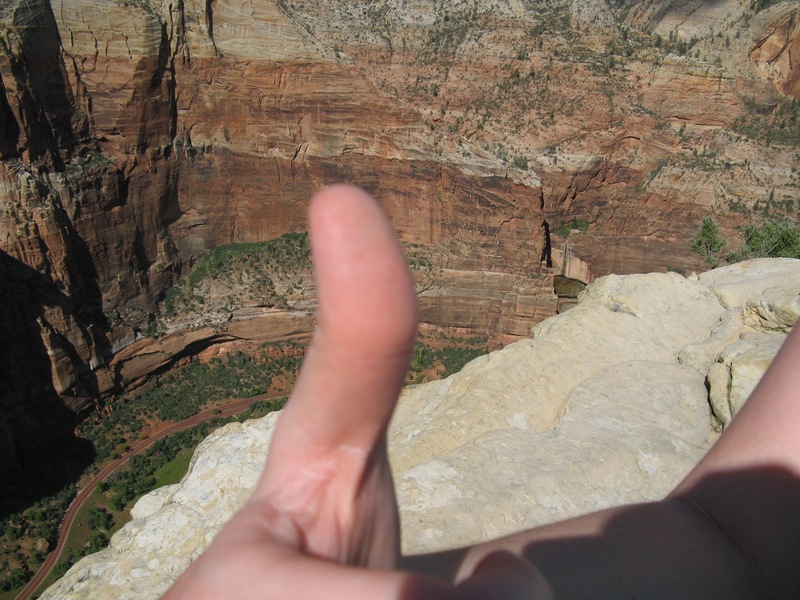 You see, the Havasupai backpacking trip mentioned above had some switchbacks, and those almost killed me. But my memory is a wonderfully stupid thing–it tends to block out the bad and retain the good, so instead of equating “switchbacks” with “misery,” I just thought, “Oh cool. Like Havasupai” and pictured blue oasis waterfalls and feathery green trees spread out against red rock. But up the Angel’s Landing trail we went, marveling at the ratio of foreigners to Americans and enjoying the breathtaking views of the cliffs and valleys and floral arrangements. I think I forgot what a switchback was, because I thought we’d hit them far before we actually did. In fact, when Matt said that we were just starting the switchbacks, I probably did the equivalent of a fainting attack in my mind. You’ve got to be kidding me. Luckily, the angel of Angel’s Landing decided to be a merciful angel for about two seconds and provide us with a lush respite of cool greens and trickling streams right before the second set of switchbacks. I purposely took it slow during that part, taking in all of God’s grand designs and trying to gather some breath before the next set started. But then there they were again…my mouth gaped open as I craned my neck upward, seeing no end to the back-and-forth zig-zagging trails. And, just like the menace that they were, they were sizzling hot in the dry sun, looking like the switchbacks of hell itself. I licked my lips and started marching up. I stopped about twenty feet later. And so it went…march, stop, march, stop. Stop for longer. March for shorter. That is, until we saw the Germans. Oh no. They might beat us in the Luge at the Olympics, but they were not going to beat this poor American girl to the top of this angelic cliff. So I started huffing and puffing my way up, refusing to take breaks as often as I did before and refusing to take as many pictures. 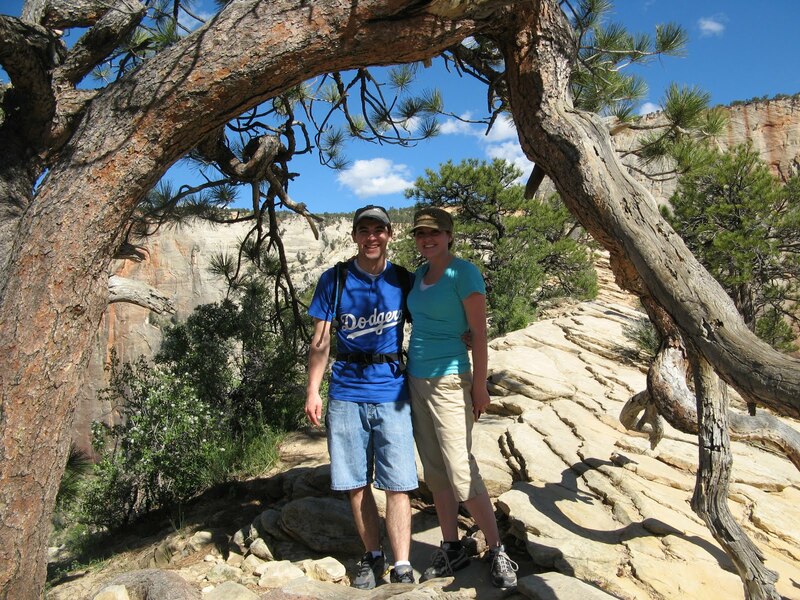 They led us for much of the way, until we got past the switchbacks and got to the real angelic part of the trail–angelic because you need angels holding you up so you won’t fall to your death over the sides. You see, the last half mile of Angel’s Landing is all hefty let’s-climb-up-the-cliff-face-with-chains action, where there are sheer drops on either side of you and almost no room for passing. My greed for conquering the Germans somehow overcame my fear of falling thousands of feet to my death, and Matt and I pressed forward toward the top. I knew we were meant to be together. Anyway, I’ll try not to drag out my story too much longer, but I do have one more little tidbit of Challenge fun–while Matt and I ate our melting pastrami-and-cheese sandwiches at the top and enjoyed the sun burning our faces, there were ten or so pesky squirrels that just seemed a little too familiar with humankind for comfort; they would scamper right up to my knees with their paws up and their teeth muttering, “Feed me! Feed me!” I tried to see if I could shove them off the cliff to see if they were flying squirrels, but they were too quick for me. (They were apparently pretty stupid too, since they kept coming back). Anyway, we’d shoo-ed them towards more squirrel-friendly hikers and were trying to enjoy our picnic when all of a sudden, my thumb, which had been resting along with the rest of my hand on the sun-warmed sandstone, felt a sharp pain that seemed to shoot quickly from my toes to my head in a split second. I whipped my head around to find the culprit–a sniggering, sneaky squirrel was just scampering over the cliff, his bushy tail a mark of defiance. Matt didn’t believe me at first until he saw the red mark. Then he threatened to kill all the squirrels within a 20-foot radius. Ah, that’s my man–always willing to beat up a two-pound furry creature for me. Isn’t he charming? While my thumb did an awkward little throb-numb-throb dance for me, I took about two seconds to worry about whether or not I could have gotten rabies. But, after careful inspection of the wound site, I shrugged my shoulders and took another sip of Gatorade. And that, my friends, is the story of how I threw down a mountain, narrowly escaped rabies, and quite positively beat some Germans. Hope you ynjoy the pictures below. And next time you’re out hiking, watch out for those squirrels—they can be deadly. Where the squirrel bit me. You can’t see it in this picture, but he did. Change It Up Succesful: Yes. 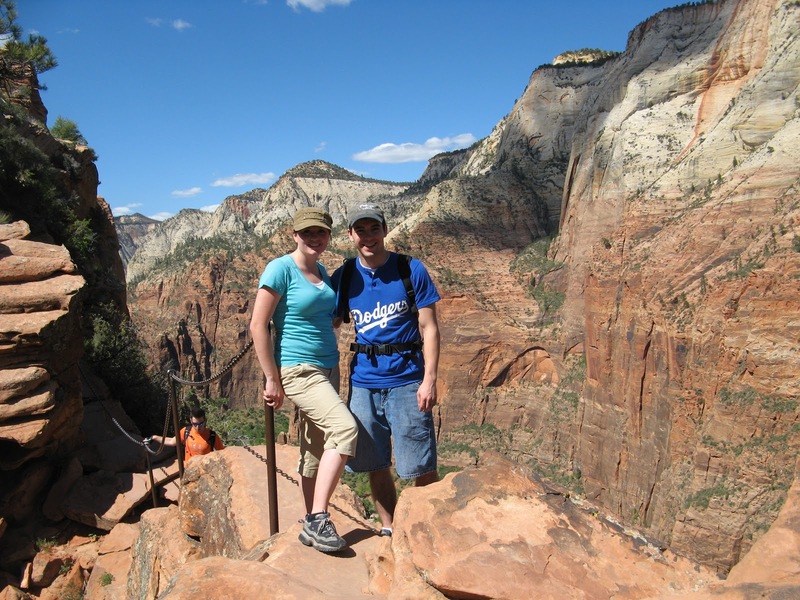 Although not a hike for the fainthearted, the view at the top of Angel’s Landing is definitely worth the grueling hike. However, make sure to bring along plenty of water, plenty of squirrel poison, and plenty of good-natured competitive feelings towards foreigners to make the ride the most thrilling it can be.